Politics, like football, is one interesting game where people can spring a surprise even when it is least expected. 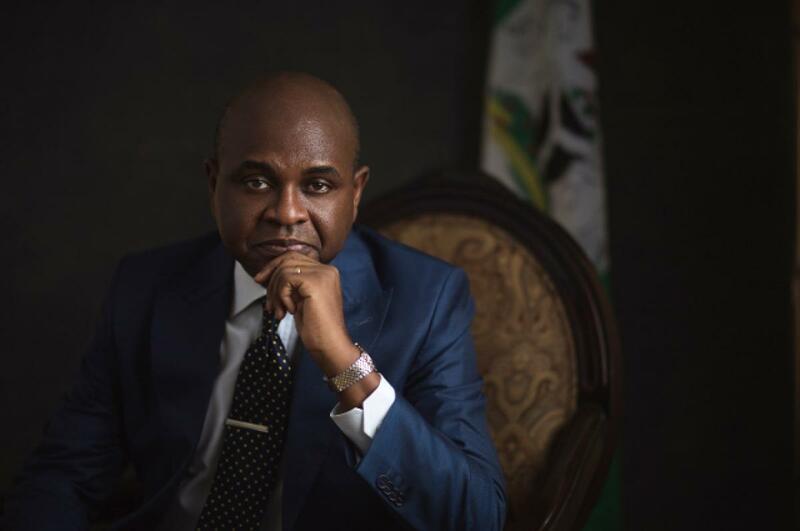 Although the ruling All Progressives Congress (APC) and the main opposition Peoples Democratic Party (PDP) have dominated the air waves with their campaigns, the presidential candidate of the Young Progressives Party (YPP), Prof Kingsley Moghalu, has promised to shock Nigerians in the February 2019 presidential election. In this interview, the renowned political economist and international diplomat stressed the need for generational shift in leadership, saying that is what he represents for the ultimate liberation of the downtrodden. What inspired you go into the 2019 presidential race? I am inspired to join the race because our recycled politicians have made life much more difficult for hardworking Nigerians. They have closed opportunities for our youths and our children. And it is necessary to reinvent the future. That’s why I am offering myself to Nigerians to give me the mandate to be president to change our country’s trajectory. Nigeria’s trajectory is on a very disastrous course right now with rising poverty, unemployment and population. That’s a dangerous cocktail. If it is not changed by competent and visionary leadership, this country is headed for a bleak future. No doubt, you have a very rich profile as a renowned political economist, international diplomat and former deputy governor of the Central Bank of Nigeria. But have you identified the basic problem of this country and why the economy is nose-diving so that you will not be giving excuses for non-performance when you get the office? The reason the economy is nose-diving is because political leaders are economically illiterate and incompetent. That is why it is absolutely necessary in 2019 that we have a president who understands economic transformation. Nigeria is a country of two hundred million people with a lot of economic potentials. But the country has become the poverty capital of the world because we have political leaders who don’t understand the economics and economic management. So, the basic problem of our economy is that our politicians are into consumption, but they don’t understand the principle of production. What we should be interested in as leaders is the wealth of the nation and its citizens and not our personal gains. And I will meet that challenge with success. You have to understand economic philosophy. Based on economic philosophy you develop economic vision, based on economic vision you develop economic policy, based on economic policy you create an institutional and market framework for the economy to function profitably for the vast majority of the citizens. This type of systemic thinking is lacking. So you find that our economy is managed by ad hoc decisions, there is no end point, there is no beginning. And when they cannot make any impact, they begin to give excuses. That is a failure because we did not elect you to give excuses; we elected you to solve a problem. We need leadership that understands economic philosophy and I will bring that leadership to the economy. I believe Nigeria’s economy should be run as a capitalist economy with a conscience in the context of developmental state. I believe in free market, but I don’t believe government should completely take its hands off the steering wheel. Else it becomes an economy for rapacious instinct-sharks who can manipulate the economy for their personal profits whereas majority of the people of the country are becoming poor. It is government’s duty to set the enabling framework and the environment where poor people can be translated from poverty structurally into the middle class. That is my economic vision. And it can be achieved on the basis of capitalist economy. This is a country where people vote for political parties rather than individual candidate. Coming on the platform of a party that is relatively new and unknown, how do you think you can actualize this aspiration? What you are describing is the past, we are moving into the future where the majority of Nigerians are looking for capable individuals. Beyond that, we are popularising Young Progressives Party (YPP). More and more people are getting to know YPP. There was no alternative than to join a new party because APC would not accommodate the vision of someone like me. So if you go and join them because you want to join a popular party, then you are not serious about serving Nigerians. That is why I chose the hard work of going outside an established party and joining a new party. And we are building a new structure. YPP has structures in 36 states of Nigeria today down to every local government. The good thing is that the youths constitute the bulk of the population of this country. But how much can you really count on them knowing that the majority of them don’t have PVC to vote? You are absolutely right. But now a lot more youths are getting interested in politics. It is just that they are not doing so in a structured manner. They are not doing so from a very informed perspective. The youth should decide what we want of a president, what are the requirements of a good president. The fact that a person is young doesn’t necessarily make that person a good president. But on the other hand, we want a generational shift to a younger leader. What I am saying is that they should be looking for a leader like myself who is young, but experienced. It is the combination of those two things that can give you a new vision for the 21st Century and a track record that you can actually run Nigeria. For example, I was a deputy governor of Central Bank where I led far reaching and extensive reforms, including the reform that stabilised the Nigerian banking and finance system after the global financial crisis and prevented bank failures and the reform that introduced BVN into the payment system. These are things that have huge impact in the lives of Nigerians. If I could achieve these at the CBN, then imagine what I could achieve as president. I have had a long 17 years career in the United Nations where I have helped to build and fix other broken nations like Cambodia, Rwanda, former Yugoslavia, and Croatia. With that kind of track record I understand the task of nation building. Nigeria needs an economic transformer. I have experience of economic leadership. No candidate in the 2019 general election has the kind of track record I am bringing on board. So I’m prepared to be president. How do you see the idea of a coalition working together to present one candidate? Let me tell you, all the independent pollings that I have seen shows clearly that outside the APC and PDP I am the Third Force. So when people talk about coalition, they should talk it based on reality. My appeal cuts across various demographics in this country. I have a strong following in the youth; I have a strong following in women. I am the first presidential candidate since 1999 who has named a woman as vice president. But you also know that we have a woman who is contesting too: Oby Ezekwesili? (Cuts in…) That is okay. It is for the electorate to judge. My vice president is a 37-year-old woman from Kano, Mrs Umma Getso. This thing shows my commitment to gender equality and commitment to the youths of this country. The price of crude oil is sliding and may likely continue like that till 2019. How would you predict the outlook of the economy for next year? Our Nigerian politicians worship small gods like oil price. No country that has made economic progress has ever relied on natural resources. It is the value addition that your economy can create either through manufacturing or export of value added products that creates the wealth of the nation. The only thing our politicians know of is how to spend oil money when they have it. When the price is down, then the economy will crash. We need somebody with a new economic mind like I have. My economy vision will be driven my innovation and human capital not by natural resources. We are going to create 774 skill acquisition centres in each local government in Nigeria so that the youths can learn practical skill. We are going to create venture capital funds that will invest capital into new businesses. It is time for Nigerians to vote this present government out. Don’t agonise, organize. This government is incompetent. They should be voted out of office because their performance track record is zero. PDP is not an option because it will achieve a Nigeria where the contractors and the big businessmen will be getting richer and the poor getting poorer. APC will continue to recycle poverty. Neither of these two parties can lead Nigeria to the 21st Century. We need a younger, competent, technocrat and vibrant leader like myself to do the job. In specific terms, how are you going to address the issues of insecurity, education, healthcare delivery system among other challenges facing the country? I will address the issue of security with much more understanding. This government has a very narrow understanding of security. I will bring professionalism into the leadership of our security agencies. Right now, Nigeria security agencies are headed on the basis of parochialism. The agencies are headed by people from one section or one religion. I will change this with professional leadership of our security agencies. I will reform the security of our borders. We will toughen and tighten our border security management such that nobody can sneak into Nigeria without being recorded and where that person is going. If the person is screened and found not worthy of entering the country, he will be turned back. ECOWAS free movement treaty does not take away the right to screen people coming into the country. I will build 21st Century police force for Nigeria when I become president in 2019. We will recruit and train 1.5 million police over four years. My government will build six world class hospitals within four years in each geopolitical zone. We would bring back a lot of our medical doctors abroad. We will strength the health system. My government will have programme for the Diaspora return. It’s going to be good for our country if I am elected president of Nigeria in 2019. We will embark on constitutional restructuring. I am a strong believer in restructuring. We cannot make progress unless we restructure this country. Some people talk of restructuring to get votes. Nigeria must return to proper federalism. And I urge Nigerians to do the right thing to set our country free. There is no hope in APC or PDP.